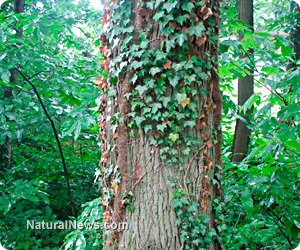 (NaturalNews) Experienced campers and hikers will be familiar with the unpleasant itching caused by contact with poison ivy, the innocent-looking North American plant with a truly venomous bite. Indeed, many summer camping or hiking trips have been cut short because a team member was afflicted with contact dermatitis - a skin condition caused by an allergen found in poison ivy, urushiol, which produces an extremely itchy rash that can make outdoor excursions a misery for those allergic to it. While conventional treatments for poison ivy rashes are plentiful, these creams and gels are almost always made from synthetic ingredients that have little appeal to health-minded individuals. So, let's take a look at some natural alternatives instead. Please note that the following treatments can also be used for poison oak and poison sumac rashes. Baking soda - A paste comprised of baking soda and water can do wonders for a poison ivy rash. Freshen the application every 2 hours for up to 3 applications per day. You could even take a baking soda bath before retiring to bed. White vinegar - The efficacy of standard white vinegar to ease itches has been known for centuries. Simply apply it to a cotton ball and gently rub it onto the affected area several times a day. Aloe vera - That aloe vera is often a central ingredient in anti-itching creams (natural and pharmaceutical) should tell you all you need to know about its anti-inflammatory properties. Applying some natural creams containing aloe vera onto the poison ivy rash will ease its aggressiveness in no time. Oatmeal - It may sound a little eccentric, but an oatmeal bath works wonders for blistered or irritated skin since oatmeal works as a skin protectant. Banana peels - Rubbing banana peels on rashes is a great way to soothe inflammation, since they contain a large number of antioxidants and minerals that help the skin restore itself naturally. Potato paste - The soothing effects of potato paste have been known for hundreds of years. Simply mix some white potatoes in a blender and apply the thick paste to the affected area. Coffee - Because coffee beans contain a powerful anti-inflammatory called chlorogenic acid, a good-quality coffee can soothe a poison ivy rash. Please note, however, that unlike the treatments listed above, little research has been done on coffee and its ability to treat this condition. Therefore, coffee should be considered a last resort remedy. Clearly, most remedies for poison ivy rashes involve ingredients that are easily found around the house, or which are inexpensive to buy. Therefore, if you intend to camp in or hike through an area that contains poison ivy, oak, or sumac, it is a great idea to carry at least one of the above ingredients in your bag, as well as the aforementioned rubbing alcohol to prevent an allergic reaction from the outset. If you prepare in advance for possible contact with these plants, then you reduce the risk of having an adventure ruined because of the persistent and unbearable itching it causes.